I didn’t realize that birds were cool until I was a senior in high school (4 whole years ago). Just to be clear, this article is talking about the kind of bird that flies in the air, not the electric scooter that Georgia Tech students ride to class when they’re late. 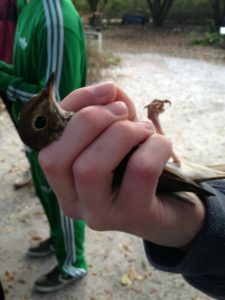 Ornithology is the study of birds, and I was lucky enough to take a class in high school that let me learn about them hands on. I’ve included some pictures at the end of experiences I’ve had with birds, but first, here are some of my favorite, more exotic, birds. 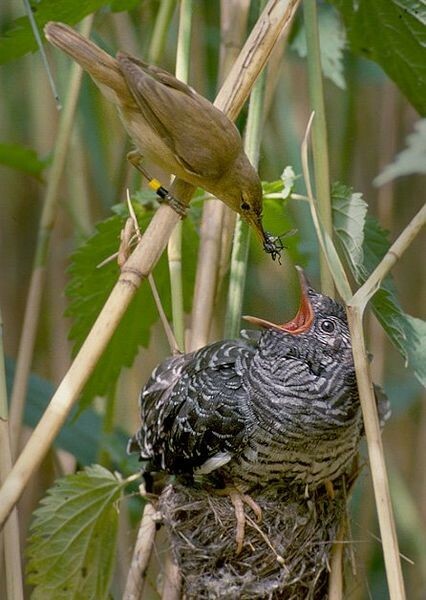 Cuckoos are parasitic birds that lay their eggs in the nests of a different bird. The host can range depending on the location of the cuckoos and the specific cuckoo species, but most parasitic birds tend to pick hosts who are insectivores in order for their offspring to have a high protein diet (Payne). After the cuckoo lays its egg in the hosts nest, several events can occur. In some species of cuckoos, the cuckoo will hatch before the hosts eggs. This young cuckoo will then take the eggs of the host bird one at a time and eject them from the nest using its back. This allows the cuckoo nestling to receive all the attention, and food, from it’s host instead of splitting it with other nestlings. Other species of cuckoo won’t eject the hosts eggs, and the two species will be raised together by the host (Rothstein). Cuckoos have some mechanisms to prevent suspicion from their host. 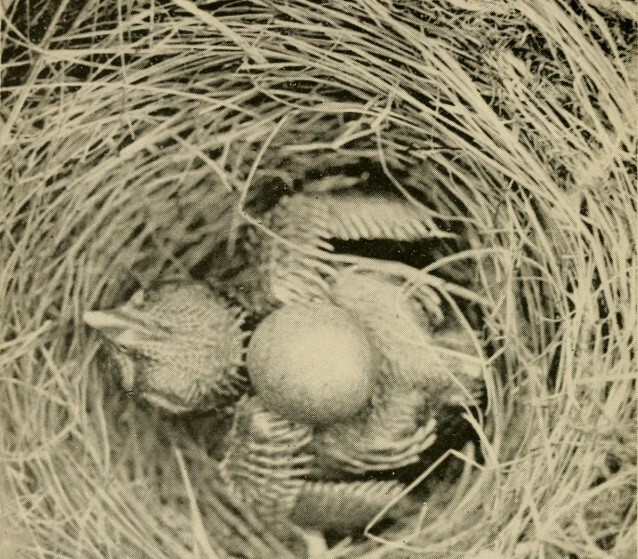 Cuckoo’s eggs tend to mimic the eggs of their host in appearance and size, and the nestlings will tend to have similar feeding habits to their host. When the host’s nestling and the cuckoo are reared together, the young tend to resemble their nest mates at the beginning then grow significantly larger than their nestlings and possibly even larger than their host parents (Rothstein). Pictured below is a cuckoo nestling ejecting other eggs from the host’s nest, and a cuckoo nestling being fed by its, much smaller, host parent. Bower birds have an aesthetic mating ritual. Male bower birds build intricate structures, called bowers, decorated with colored objects to impress a female bower bird. The bowers are created with twigs, and the objects used to decorate them can range from fruit and flowers to shells or grass. 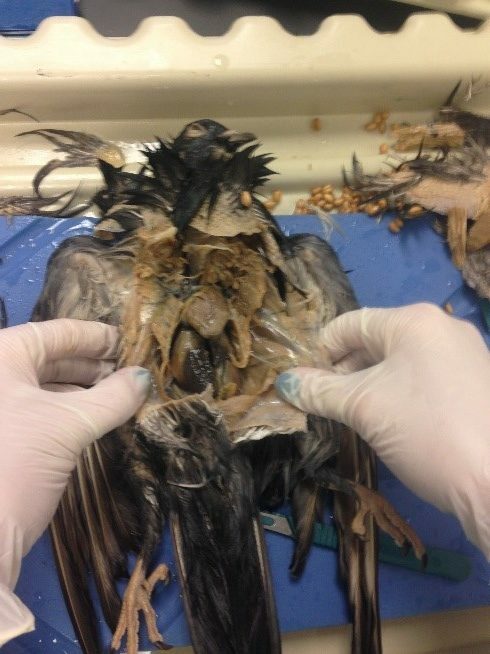 Birds near human contact will sometimes use flashy man-made pieces like jewelry or glass. 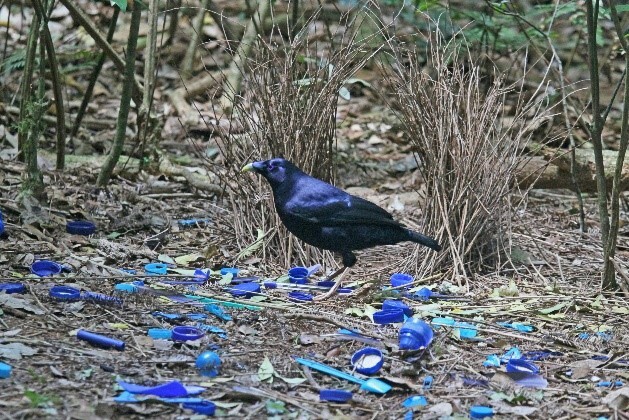 The objects will be set in piles around the bower for the female to inspect. In at least one species of bower birds, the males will decorate their bowers with colors matching that of the intended female (Marshall). The bower isn’t the only part of the birds’ mating ritual. 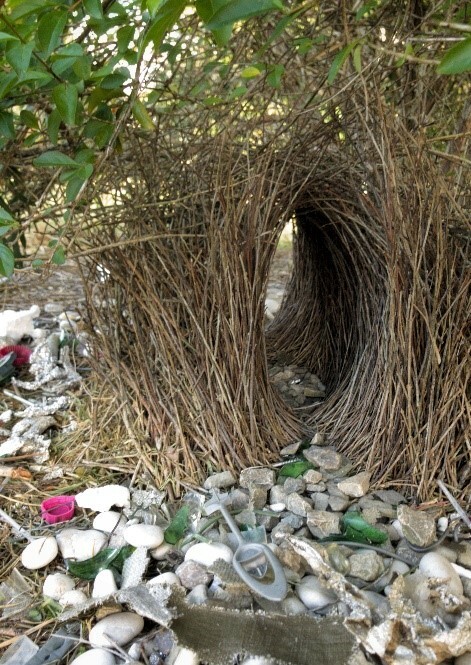 The female will watch the bower being built and the collection of objects for multiple months. During this time the male displays dances and mimics calls of other birds. When there’s enough food in the environment for a female bower bird to rear young, she can mate with the male. The female then leaves to create a nest and raise the young without the help of the male. The male can stay at its bower and attempt to mate with other females. It’s not restricted to mating once per season (Marshall). Below are two pictures of bowers each decorated with unique objects. Kea, sometimes referred to as the sheep killers, are a native parrot of New Zealand. They’ve been protected by the New Zealand Wildlife Act for several decades, but many people find them to be a nuisance because of their curiosity. Human machines and buildings can be damaged or destroyed by the Kea’s sharp beaks and inquisitive attitudes (Brejaart). Slightly after sheep were introduced to New Zealand, the kea received a reputation for killing even though early numbers suggested that less than 5% of sheep were affected by the parrot. 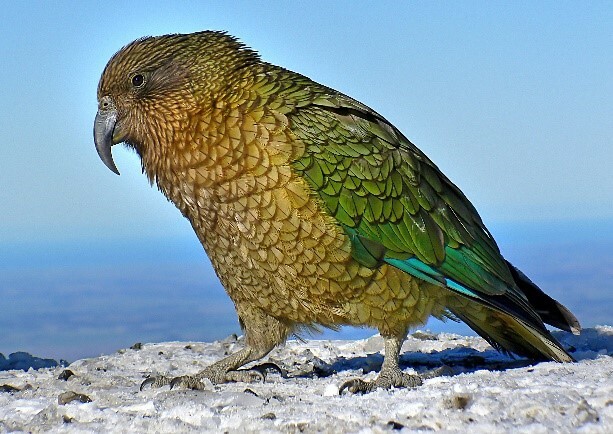 The government and private citizens established bounties in the late 1800s requesting kea’s beaks and heads, and these bounties continued until 1971 by which time an estimated 150 thousand keas were killed. Many researchers suggest that the death of sheep by non-kea causes were attributed to kea which lead to their villainous reputation (Brejaart). So how does a bird kill a sheep? Keas are known to land on a sheep’s back before picking at the outer wool until reaching flesh. They feed on the sheep while the animals are still alive, but the ultimate cause of death for the sheep would be blood poisoning or the like (Brejaart). Kea don’t just feed on live stock. In fact, a majority of their diet when under observation in Craigieburn Forest Park consisted of nuts and fruit (Brejaart). Below is a picture of a Kea, but if you would like to see something more graphic, look up ‘Kea feeding on Sheep’. Butcher birds are another species with an especially interesting feeding habit. They take their prey which ranges from small fledglings to insects and kill them using tools before consumption. Some of their anatomy resembles that of other meat consuming birds including their beak, but they lack the talons to physically pull their food apart. This is where their unique actions come into play (Beal and Waldo). 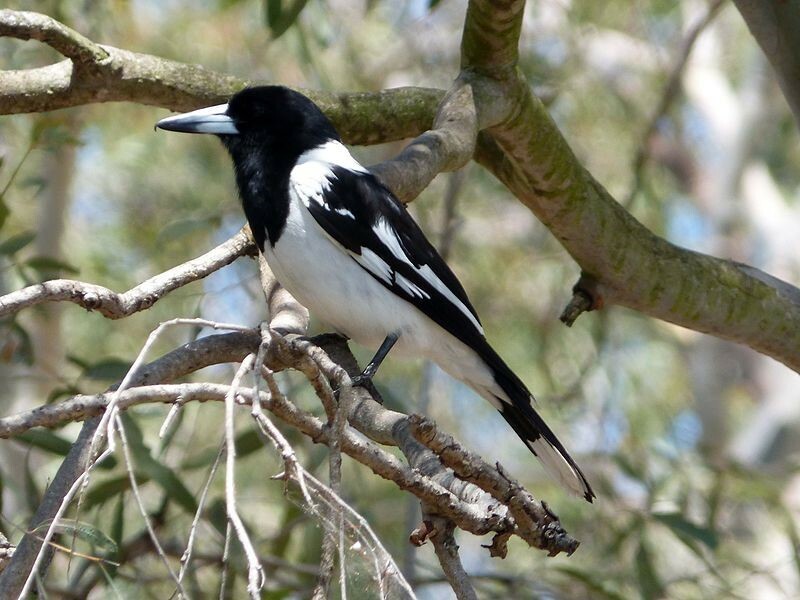 Butcher birds take their prey and wedge it into the forks of branches (Marshall). This allows it to kill its prey or hold the prey in place while the bird pulls it apart with its beak. The most common prey are insects like grasshoppers and crickets with beetles coming in second. Depending on the species, the consumption of vertebrate (including birds, reptiles, and mammals) can range from 12% to 28% of prey (Beal and Waldo). In times of plenty, some researchers suggest that the birds store extra food on sharp branches. The Australian counter part of the pied butcher bird is the Loggerhead shrike which impales its prey on wire and branches (Beal and Waldo). Pictured below is a pied butcher bird, and you can also look up more graphic photos of their feeding habits. Moas, sometimes referred to as the elephant bird, are a large flightless bird ranging in weight from 45 lbs to 550 lbs. Unfortunately, they went extinct after Polynesian colonists arrived in New Zealand. Besides their incredible size, Moas are interesting because of the impact they had on natural scientists and their incredibly fast extinction after humans were introduced to their environment (Anderson). Early scientists heard tales of moas ranging in height to about 16 and a half feet, and they constructed the fossils found to support these myths. Moas actually range up to 8 feet tall, which is still a significant height. Research also shows that the birds were wingless (Anderson). Some people say that the moas have been romanticized through the ages, but you can decide that for yourself. 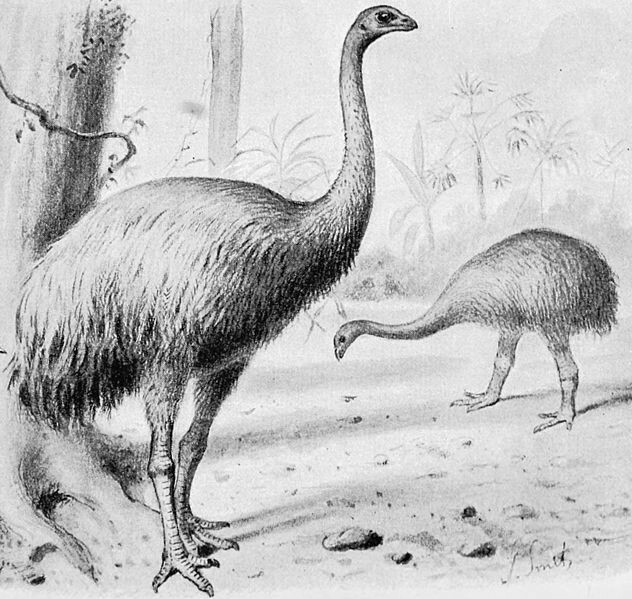 Below is a drawing of what the moas looked like before their extinction. 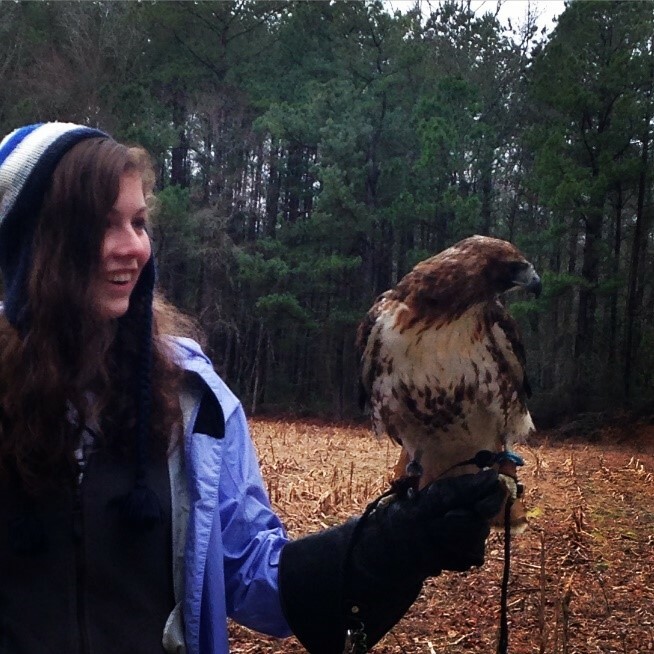 This is me when we took a red shouldered hawk to falcon. This means that we took the red shouldered hawk to a forest and released it—watching as it attempted to catch squirrels with its talons. Fun fact: you can use any bird of prey to falcon. This picture is from when we dissected crows in the lab! It freaked me out a little at first, but once I opened the crow, it was really interesting. This is a picture of me holding a brown thrasher (I think). We would catch birds in mist nests then take their measurements. 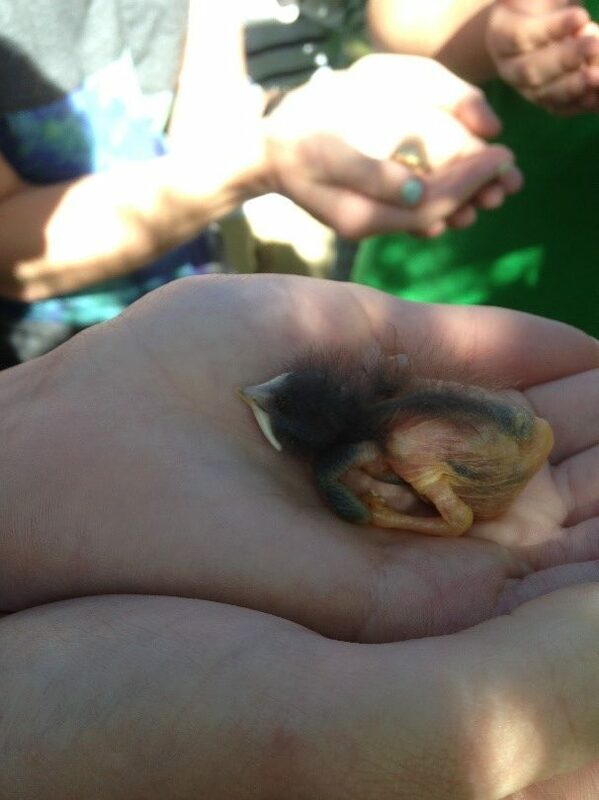 When you hold a bird, you have to put your index and middle finger below its head. Blue birds make their nests in holes, so we had blue bird boxes around our campus. As a class, we would go around and periodically count the number of eggs in each box, and eventually we got to see the fledglings. It’s untrue that if you hold a baby bird or an egg that the mother will never come back. Anderson, Atholl. “Interest in Moas.” Prodigious Birds: Moas and Moa-Hunting in New Zealand, Cambridge University Press, 2003, pp. 2–3. https://books.google.com/books?hl=en&lr=&id=-Oo_kFo09VEC. Beal, Foster and Waldo L. McAtee. “Southern Butcher Bird.” Food of Some Well-Known Birds of Forest, Farm, and Garden, U.S. Dept. of Agriculture, 1922, pp. 29–32, https://books.google.com/books?hl=en&lr=&id=OewYAAAAYAAJ. Brejaart, Ria. “Diet and Feeding Behaviour of the Kea (Nestor Notabilis).” Diet and Feeding Behaviour of the Kea (Nestor Notabilis). 1998. Lincoln University, PhD disserataion. Marshall, A. J. “Bower-Birds.” Biological Reviews, vol. 29, no. 1, Feb. 1954, pp. 1–45. doi:10.1111/j.1469-185x.1954.tb01395.x. Marshall, David. “Stray Feathers: Feeding of Butcher-Birds.” The EMU, vol. 47, July 1947, pp. 68–69., www.publish.csiro.au/MU/pdf/MU947054r. Payne, Robert B. “The Ecology of Brood Parasitism in Birds.” Annual Review of Ecology and Systematics, vol. 8, no. 1, Nov. 1977, pp. 1–28., doi:10.1146/annurev.es.08.110177.000245.